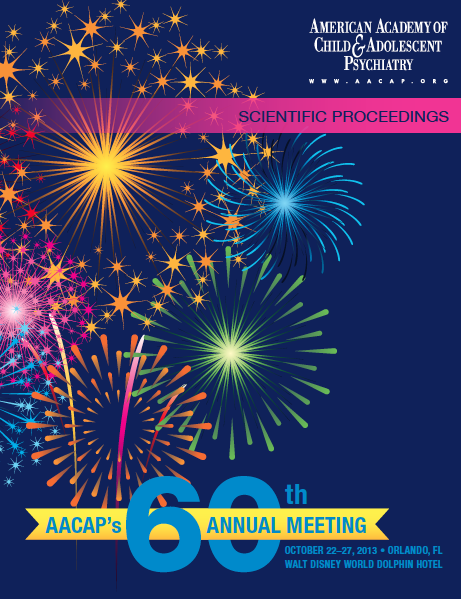 For the first time in several years I had the opportunity to attend the American Academy of Child and Adolescent Psychiatry’s Annual Meeting, held this year in one of my favorite cities…Orlando, Florida. Dr. Elizabeth Brownlie and her colleagues from the University of Toronto have observed that youth with language impairment have high rates of anxiety and social problems and may be vulnerable to social anxiety in adulthood. They compared a cohort of children with language impairment and typical language controls in rates of social phobia and subclinical social anxiety symptoms from age 5 to ages 19, 25 and 31 in a prospective longitudinal study (n = 142) at age 5 to matched control group (n = 142). Childhood language impairment was found to be associated with subclinical levels of social anxiety in early adulthood, particularly related to social interaction. The findings support the notion that communication difficulties in childhood may lead to social anxiety in adults. One of the challenges we face as clinicians when treating kids with depression is accurately describing to parents the additional benefits of combining cognitive-behavioral therapy (CBT) with medication. A study by Dr. Manesh Aligeti and colleagues at UT Southwestern Medical School looked at the benefits of CBT for relapse prevention in a sample of 8-17 year-old patients (N=144) who had been positive responders to fluoxetine. The only impact the CBT appeared to have on medication management involved the use of lower doses of fluoxetine among the kids who were also receiving therapy. Examining the same patient sample, Dr. Graham Emslie found that kids receiving CBT in addition to medication had a significantly lower risk of relapse than those receiving medication alone during the 30-week continuation treatment period of the study. The estimated probability of relapse was 7.5% among kids receiving medication and CBT vs. 28% among kids receiving CBT alone. Dr. Linmarie Sikich and her team at the University of North Carolina sought to determine the tolerability and efficacy of extended treatment with intranasal oxytocin (a pituitary hormone referred to by some as the “bonding hormone”) as a supplemental treatment for children and adolescents with an autism spectrum disorder. Measures of social reciprocity and social functioning showed improvement in the oxytocin group vs the placebo group. The improvements persisted and were more noticable with extended (16 week) treatment. There was no difference in adverse effects of the treatment group versus children and teens who received placebo. Oxytocin appears to have been well tolerated by most children over 16 weeks of sustained treatment. The hormone appeared to reduce irritability and improve some aspects of social functioning in a sample of 3-17 year-old patients with autism spectrum disorders. Finally, in an issue that hits close to home and has been a long-term concern of mine, a team from The Ohio State University compared polypharmacy patterns and rates over time among kids in foster care (FC), kids with disabilities (ABD), and low income kids (CFC) who qualified for Medicaid. Kids ages 17 years and younger who were continuously enrolled in Ohio Medicaid for a 1-year period and prescribed at least one psychotropic medication (antidepressants, antipsychotics mood stabilizers, stimulants, alpha-agonists and anxiolytics) during fiscal years 2002 (n = 26,252) through 2008 (n = 50,319) were selected. Polypharmacy was defined as ≥ 3 medications and multi-class polypharmacy as ≥ 3 medications from different drug classes. Both types of polypharmacy increased across all three eligibility groups. Polypharmacy increased from 8.8% to 11.5% for CFC youth, from 18.0% to 24.9% for ABD youth and from 19.8% to 27.3% for FC youth. Combinations that increased the most were two or more antipsychotics, two or more stimulants, and antipsychotics with stimulants and other psychotropic medications excluding antidepressants. Highest rates of polypharmacy were noted among youth in foster care. AACAP Resource Centers empower consumers through patient education. 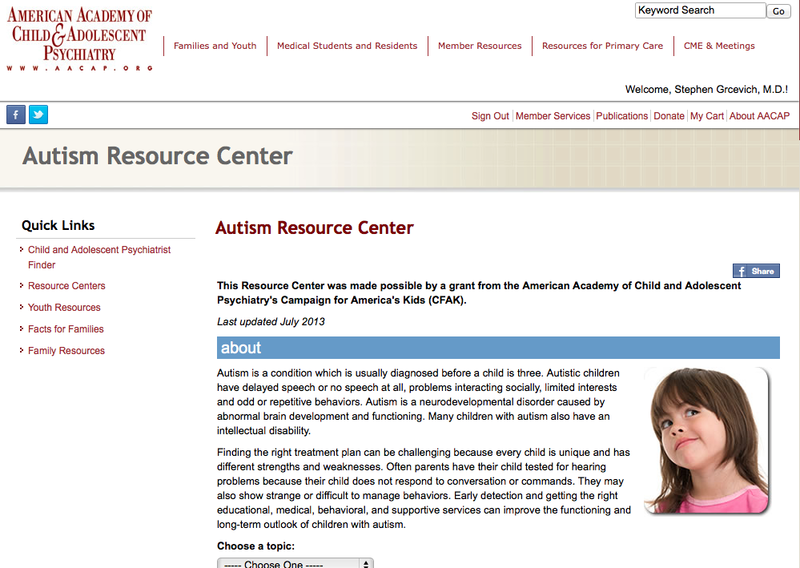 Each AACAP Resource Center contains consumer-friendly definitions, answers to frequently asked questions, clinical resources, expert videos, and abstracts from the JAACAP, Scientific Proceedings and Facts for Families relevant to each disorder. Check out AACAP Resource Centers on ADHD, anxiety disorders, autism, bipolar disorder, bullying, child abuse, Conduct Disorder, depression, disaster, military families, Oppositional Defiant Disorder and substance use by clicking here. This entry was posted in Anxiety Disorders, Autism, Depression, Key Ministry, Mental Health and tagged AACAP, Autism, child psychiatry, cognitive-behavioral therapy, Depression, Foster Care, language, Oxytocin, polypharmacy, Prozac, relapse prevention, research, social anxiety. Bookmark the permalink.